The city has in recent years gone to great lengths to ensure it is involving citizens and stakeholders in a meaningful way in the development of new strategies and programmes. The development of ‘Neighbourhood Laboratories’ to capacity-build at a very local level and steer the evolution of local plans & projects would be of great interest to many members and peer cities across Europe. The city benefits from a number of wealthy philanthropists who have invested in very large and high quality facilities in the city, all focused on education and knowledge enhancement. A particular feature of all of these facilities was the notion of ‘hands-on’ learning and learning through mistakes. Fondazione Golinelli in particular has a wonderful fun and creative approach to school-age education, which encourages experimentation, entrepreneurship and ‘live’ practice in order to build tomorrow’s generators of economic prosperity and resilience, which would provide excellent transferable best practice across Europe. The fact that every member of the assessment team reverted to play within 10 minutes of entering the building is an illustration of its success in terms of design, content and atmosphere! The role of major education institutions in the physical, economic and social development and well-being of a city. Bologna would provide a good case study – as part of a comparable cohort of peers – for the opportunities and challenges this can bring. Bologna would provide an interesting case study on the role of street art as a valid form of socio-economic expression, again with a comparable cohort of peers. The fact that the assessment team for Bologna had very polarised views on this illustrates the potential power and influence it has – both positive and negative. The assessment team were unanimous in their support for the highly unique and innovative approach the city has taken to its new branding approach, both in terms of the development process and the final output. This would provide an excellent case study for other European cities. Bologna is the capital of the Emilia-Romagna Region in Italy, located on the edge of the River Po plain, at the foot of the Appenine mountains in the valleys of the rivers Reno and Savena. It has been an urban centre since at least 1000 BC, first under the Etruscans, then the Celts, then under the Romans (who built the Via Emilia, which defines the east-west axis and transect of the city). At the end of the 13th century, Bologna was the 5th most populated city in Europe and one of its first ‘free’ cities. Its population in 2015 was just over 386,000 (the 7th largest in Italy), with a metropolitan population of just over 1m. It is a compact easy-going city, with unique and visually inviting historic core, which is welcoming, safe and has a reassuring ‘human-scale’ to it. 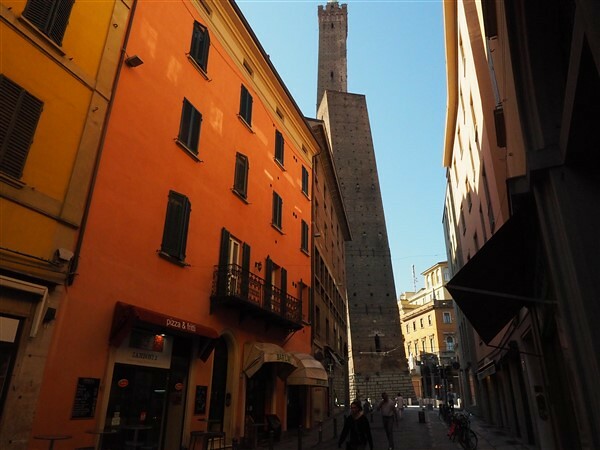 Bologna has a 40ha well-preserved historical centre which is Europe’s 2nd largest. It contains a wealth of important medieval, renaissance and baroque architecture including medieval towers (notably ‘Due Torri’), 40km of city centre porticos, the large central squares of Piazza Maggiore and Piazza Nettuno, which dominate civic and social life in the city, and a 60km twelfth-century hydraulic network of underground locks, cisterns and canals connecting the city’s two rivers to the historic centre. Large-scale urban renewal projects in the late 19th century and wars – notably the Second World War – caused significant damage to its urban heritage, notably to its historic walled form. New laws in the 1960s & 70s led to protection and a major programme of repair and conservation (’i storica Bologna’); there has been a further focus on upgrading the historic core to try to diversify economic uses and increase residential densities over the past 20 years. Since 1088, Bologna has been home to what is believed to be the oldest University in the western world. Unlike others at that time it was not founded on religious philosophy, but on city governance and trade. The university still has a significant influence on the city to this day: it has significant landholdings both within the historic core and city peripheries, and its 52,000 young students fundamentally change the city’s demographic, cosmopolitanism and socio-cultural activity seasonally. Whilst the city is a key partner for the municipality, with clear evidence of partnership working, there is a question as to the university’s status and power, and whether it could be a more dynamic and equable partner amongst city stakeholders. In addition, it was not clear how its student cohorts were engaged in the development of city-level plans or neighbourhood initiatives, which the assessment team felt was important given the scale of their presence in the city. The university and municipality also admit they wish to improve current graduate retention rates – a problem throughout Italy as a whole since the 2008 economic crisis – as this impacts upon potential for high-skilled contribution to economic growth and diversification. The combined presence and patronage by both the University and a wealthy mercantile class, plus its ‘communitarianist’ approach and self-proclaimed role as ‘food capital of Italy’, have made Bologna an important artistic and cultural centre for many centuries. This was recognised with the city being awarded European Capital of Culture in 2000, and by its current petition to UNESCO for ‘World Heritage Site’ status. It has also given the city a long tradition of left-wing cooperative socialism, which was defended through the Fascist era, and has also been the most important centre of communism in Italy. The city states that a constant feature of its evolution has been the very slow pace of change – in part due to the desire to follow a consensual democratic process, but also by the city’s continued trading-based wealth which has negated the need for change. The city has always had a strong and diverse economic base, aided by its strategic location as a key hub of Italy’s railway and road networks. Originally a textiles and mercantile city, its commercial strengths now are mechanical, electronic and food & agriculture sectors, with companies such as Ducati, Lamborghini, Maserati, La Perla and Segafredo Zanetti based in the city. Its ‘Fiera’ district (trade fair) is the second largest in Europe. This broad economic base, along with a strong focus on high-tech manufacturing and R&D, has been key to sustaining the city through late twentieth-century industrial restructuring better than other Italian cities. However, it has been hit harder by the post-2008 economic crisis (as indicated by it falling from the E-REGI top 50 ranking for the first time). This seems to have shaken the city from commercial inertia, with a renewed economic focus. This includes the promotion & resurgence of urban agriculture, and the positioning of Bologna as the ‘global centre for food & cuisine’ (for example via the new 8ha Centro AgroAlimentare di Bologna (CAAB) – an 8ha trade and consume food market representing over 290 producers – and the concept of ‘Eataly’). Whilst the assessment team remained unconvinced by projected visitor numbers, it will be key to building economic resilience in an existing strength, and in supporting undoubted latent potential for greater leisure tourism to the city. Another impressive initiative is the newly-developed, highly innovative new branding concept: this was initiated by the University, but developed in cooperation with the municipality and other stakeholders in the city. The brand is comprised of a unique ‘alphabet’ of symbols based on historical memories of the city (collated by extensive citizen research), which allows each entity/organisation within the city to develop their own visual ‘brand’ symbol, but within a very recognisable hierarchy. More recently, civic philanthropy has had a resurgence and so is an increasingly important influence on the city. Many new high-quality civic and educational facilities such as the Museum of the City (2012), Museum of Modern Art (MAMBO, 2015), Museum of Art Experimentation & Technology (MAST, 2015) and Fondazione Golinelli (an educational & youth entrepreneurship facility, 2015) had been funded by private wealth for the benefit of the wider population and visitors, some in creative re-use of buildings key to the city’s social and physical history. All were of a very high standard of design & detailing, and provided a wonderful legacy for the city. However, the assessment team was unclear as to how embedded these facilities were within their local communities, and hence whether the desired level of community and social benefit was being achieved. The city has very recently adopted a new structure plan, the Bologna Metropolitan Strategic Plan (PSM), aimed at breaking down the current silos between the city and its peripheral municipalities via the ‘Seven Cities’ concept. The Plan envisages Bologna as an international centre of excellence in R&D-led manufacturing, culture & creativity, social welfare and quality of life. The new PSM anticipates ‘diffused slow regeneration’, whereby public and private sectors work together to unlock land & property assets which can then act as a catalyst for positive economic change. Improving ‘urban commons’ (public spaces, heritage, cleanliness, safety and management & maintenance) is a core aim, and required a new municipal law (LR 20/2000): under this citizens & stakeholders can sign a ‘cohabitation pact’ with the municipality to set out mutual responsibilities and commitment to solve identified problems. Social housing, blue- and green infrastructure and public realm improvements are also important elements of the new PSM. Citizen participation in the development of the PSM was extensive, driven by the fact that every 10 years 25% of the city’s population changes so there is need to embed the concept of citizenship; and the need to rebuild democratic confidence after the 2008 economic crisis and subsequent domestic political strife. Over 500 ‘actors’ within the city were engaged in the development of the PSM from 2012-2013 process. Whether this has led to real social inclusion is still not clear – only time will tell – but the intent was reiterated clearly by all city representatives. Despite the considerable presence of youthful students, the average age of citizens is 51 (compared to an average of 42 in other Italian cities). It was not clear how the city was responding in terms of infrastructure or services to accommodate this demographic. Very recent economic immigration from other parts of Italy and Europe is changing demographics in the city sufficiently to necessitate new childcare facilities & primary schools, and 12,000 new housing units, although the strategy for delivery of this housing was less clear. The city defines itself as a ‘collaborative city’ rather than ‘smart city’, i.e. driven by civic engagement rather than pure technology. As an example, neighbourhood ‘laboratories’ are being set up in six key neighbourhoods to prepare and capacity-build for the pilots in 2016 of the city’s first ‘participatory budgeting’ process. That is not to say they are not using digital technologies: in 2014 a new open digital platform (‘Comunita’) was set up, which is impressive in its scope and content. The city concedes it is still working out how best use ‘big data’, but it has a comprehensive and inclusive digital infrastructure in place once they have. The municipality acknowledges it was slow to date to address environmental and sustainability issues. Its first EU-funded ‘Sustainability Energy Action Plan’ (SEAP) programme was not completed until 2013. The resultant delivery plan, the EU-funded ‘Bologna Local Urban Environment Adaptation Plan’ for a Resilient City (BLUE-AP), a major programme of investment in green infrastructure and blue (i.e. water-based) infrastructure, had just been approved by the municipality.